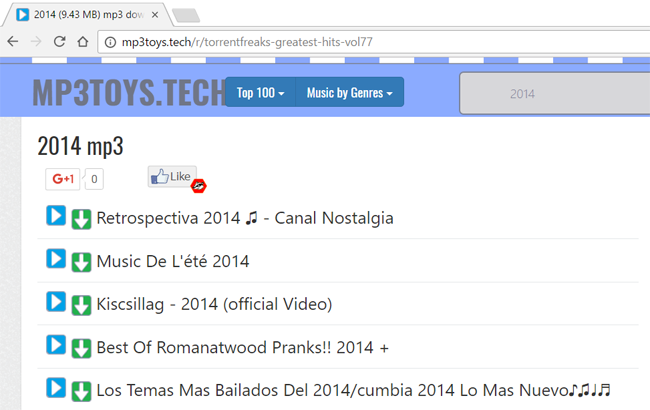 It's likely you've never heard of mp3toys.xyz since the site has very little traffic. However, thanks to a bungling anti-piracy outfit, the site is now the second most complained about 'pirate' site on the Internet, with Google receiving more than 49 million notices in just over six months. As reported in these pages on many occasions, Google’s Transparency Report is a goldmine for anyone prepared to invest time trawling its archives. 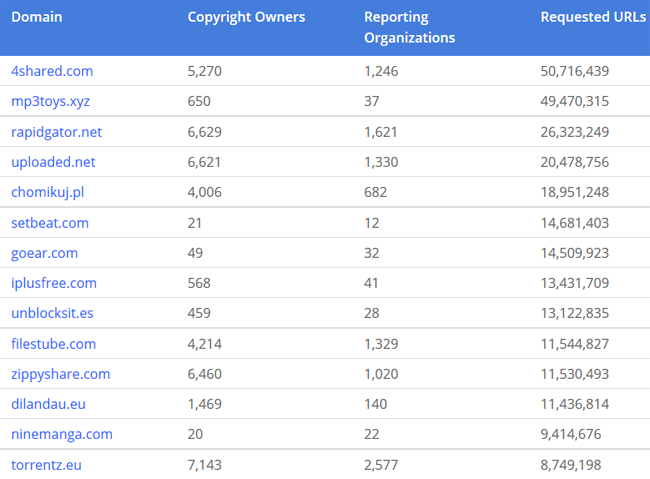 The report is a complete record of every DMCA notice Google receives for its ‘search’ function and currently lists more than two billion URL takedowns spread over a million websites. Of course, most of those websites will remain faceless since there’s far too many to research. That said, the really big ‘offenders’ are conveniently placed at the top of the list by Google. As we can see, the 4shared file-hosting site is at the top of the list. That isn’t a big surprise since the site has been going for years, attracts massive traffic, and stores countless million files. There are a number of other familiar names too, but what is the site in second place? 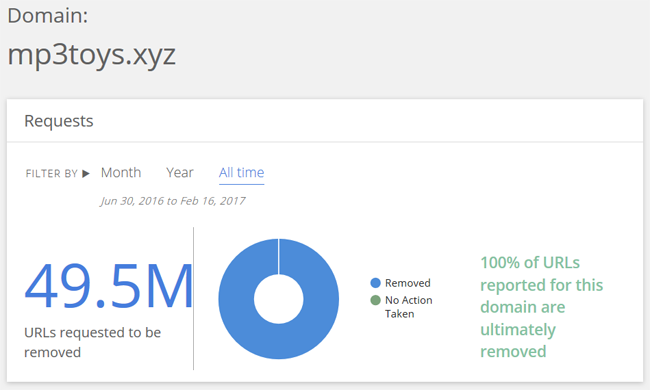 MP3Toys.xyz has a seriously impressive 49.5m takedown requests logged against it. We’ve never even heard of it. Checking the site out, MP3Toys is clearly a pirate platform that allows users to download and stream unlicensed MP3s from thousands of artists. There are hundreds of these kinds of sites around, probably pulling content from YouTube and other web sources. But here’s the problem. According to Google, MP3Toys.xyz (which also uses a .tech extension) has only been appearing in its databases since Jun 30, 2016. 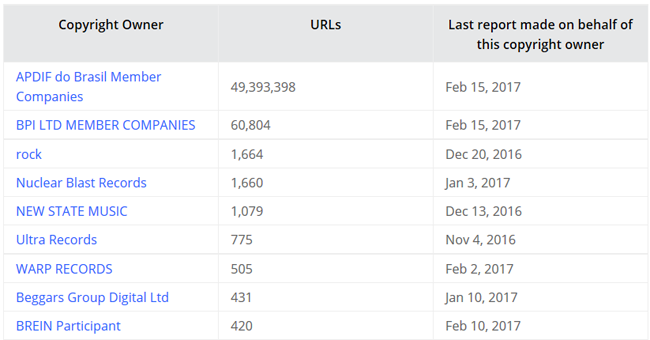 During this short time, Google has received requests to remove 49.5 million URLs from its indexes. That’s about 1.6 million URLs for each of the 31 weeks MP3Toys has been online. No site in history has ever achieved these numbers, it’s completely unprecedented. So MP3Toys must be huge, right? Not exactly. According to Alexa, the site’s .xyz domain is ranked the 25 millionth most popular online, while its .tech domain is currently ranked 321,614 after being introduced in January 2017. In loose terms, this site has no significant traffic yet will soon be the most-infringing site on the whole Internet. How can this be? Well, it’s all down to an anti-piracy company making things up and MP3Toys going along with the charade. As seen in the image below, along with outfits such as the BPI and BREIN, anti-piracy outfit APDIF do Brasil has an unusual fascination with MP3Toys. In fact, it’s sent the vast majority of the notices received by Google. However, while some of the notices are undoubtedly correct, it appears a huge number are absolutely bogus. Instead of scanning the site and sending an accurate takedown notice to Google, APDIF tries to guess the URLs where MP3Toys stores its content. A sample list is shown below. So in summary, APDIF makes up its own URLs, MP3Toys randomly generates a page of music that has nothing to do with the URL input, APDIF logs it as an infringement of its clients’ rights, and sends a complaint to Google. Then, putting the icing on an already confused cake, Google ‘removes’ every URL from its search results, even though it appears they were never in them in the first place. And that’s how a site with virtually no traffic received more DMCA complaints than The Pirate Bay. Unbelievable.